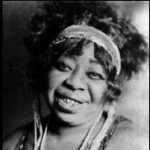 December 22, 1939 Ma Rainey, the “Mother of the Blues,” died. Rainey was born Gertrude Malissa Nix Pridgett in Columbus, Georgia in either September, 1882 or April, 1886 and first appeared on stage at the age of 14. In 1904, she began performing with her husband billed as “Rainey & Rainey, Assassinators of the Blues.” She made her first recording in 1923 and between 1923 and 1928 recorded 100 songs, including “Bo-Weevil Blues” (1923), “Moonshine Blues” (1923), “Black Bottom” (1927), and “Soon This Morning” (1927). She earned enough money that she was able to retire from performing in 1933 and run two theaters that she owned until her death. Rainey was posthumously inducted into the Blues Foundation Hall of Fame in 1983 and the Rock and Roll Hall of Fame in 1990. In 1994, the United States Postal Service issued a commemorative postage stamp in her honor and in 2004 her recording of “C. C. Rider” was inducted into the Grammy Hall of Fame as a recording of “qualitative or historical significance.” Rainey’s biography, “Mother of the Blues: A Study of Ma Rainey,” was published in 1981.